I just got an old gitane (green with yellow logo if that helps) from a friend that I would like to now more about. It's equiped with Huret gears (10 speed) maxy crank and and mafac brakes. It has kind of "elaborate" drop outs. They are somewhat web-shaped and only semihorizontal. No braze-on guides for cables and such. Any info would be welcome! To ad some more info. The maxy crank only have 3 bolts with '93 mm in between them. Not sure what that ives in BCD '106mm? My guess would be that it's an Interclub, but you might want to post the question on the forum at Gitane USA. I forgot to mention that there are scans of some old Gitane catalogs on the site that you can browse through also. You can probably find your bike in a catalog from the mid-late seventies to perhaps the early eighties. it loosk very much like an Epsom 1801 in the 1978 catalogue page 7 (http://www.gitaneusa.com/images/catalog/1978_pg7.jpg). Seems like pretty basic model with no name steel so I can safely hack it to pieces and transform it into a fixed. Have a number of the older Suntour longcage rear derailleurs of various "grades". Am planning to put a triple on my Peugeot and am considering using one of them. The upper derailleur pulley bolt is also the pivot bolt for the derailleur cage. So the uppper pulley is a pain to replace. Anyone have these pulleys self destruct on them and leave them stranded or ????? I really don't want to be beside the highway with a dead derailleur. How longlived / duriable are these? I'm using a SunTour drive trainon my commuter. I've had to replace the pulleys 3 times in 5 years due to wear in the bushing becoming pronounced enough to elongate the hole in the wheel. It's a slow process and you can spot it easily enough by simply wiggling the pulley. As for catestrophic failure of the pully, I think you'll face lots of other issues that could leave you stranded. I've been a serious cyclist most of my life and have never had a derailleur leave me walking. Not to say it can't happen, but you're more likely to get 2 flats on the same ride. that's why I carry a tube, but have a patch kit tucked away as a backup. I, too, have never been stranded by a derailleur pulley failure. In fact, in 100k miles of bicycling, the only mechanical failure which ever forced me to obtain a ride home was crank breakage. Thanks for the assurance on the pulleys. Wow. Your bike is a wonderful find. Try classicrendezvous.com for more info. Magnifique! Mid-1950s looks about right; I think that's a 49D crank. ClassicRendezvous would probably like to hear from you. Very nice! I guess that's one of the older cotterless cranksets. I was surprised not to see cotter pins. For '50 years the bike is remarkably well preserved. I recently aquired an old lightweight schwinn with upright handlebars and fenders. The headbadge is small and round and marked AS with the word 'Schwinn' above the initials, and the word 'Superior' below the initials. The chain ring has 'A. S. & CO.' cut out in it. It has a Schwinn Fore Wheel brake hub on the rear wheel. Schwinn introduced this hub in 1938. I think the bike is a 40's. Can anyone date the bike from the fore wheel brake and chain ring? How common is the brake? Can't date it for you, but just want to congratulate you on finding a relatively rare old bike. Sure don't see many of these around. Since coming across a late �40�s Schwinn Continental this past December I�ve learned that figuring out the date of an early Schwinn lightweight is a very challenging process. In fact, there�s a strong chance that you�ll never know for sure. There are a number of reasons. First, a factory fire in 1948 destroyed records of serial numbers used up to that point. Second, Schwinn seemed to encourage customization and upgrading of lightweights which would mean that the components found on a bike would not necessarily indicate a specific year. Along the same line, parts that were shown in catalogs for specific years may have remained in shops long afterwards and therefore ended up on bikes of later dates. Finally, both the number of lightweights made and the number of people interested in them is small and so the existing data is very limited. I found a few people with pretty extensive pre and early post war Schwinn knowledge on the Schwinn Collectors Forum (www.schwinnbike.com). You might try posting there, if possible with a picture or two. I�m envious of your find. Despite having purchased a modern road bike last summer, I find that most of my rides are on the Continental. I purchased this old roadster at a yard sale "cheap as chips" mostly equipped with campagnolo modolo "shifters, headset, bottom bracket, front and rear deraileur and brakes.It is blue and white and has a decal that says "original bike ribbon" "made in Italy" araya rims on campy hubs I think. Sorry I can't add a photo. Can anyone give some feedback on what I have? history, age,thank you and happy roadin. Nice, fairly sought after, Italian road bike. Hard to guess the age without seeing it, may be 70's to mid 80's. Go to www.classicrendezvous.com and click the italy box, then click the Benotto box and see some of them. They also get on ebay now and again. Value depends on condition, model and components, but maybe $100 to $250. 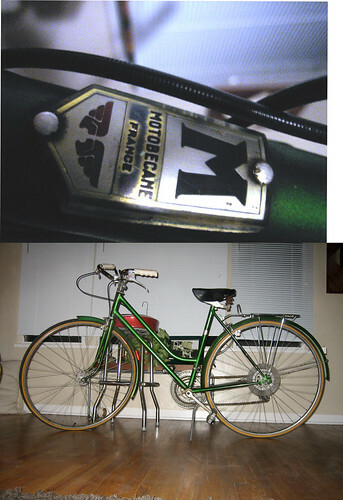 Modolo was an Italian brake manufacturer; my Bianchi came with Modolo "Speedy" sidepulls. It sounds as though you have Campagnolo Gran Sport or Record deraillerus. Hello, I've acquired a late 70's? Raleigh Pro., serial no. WA1003667, with an upside down 4 near the "W". Went to the Raleigh website (UK, I think), posted an inquiry, but no response. I need to know if I can recolor the red/yellow/black scheme to my favorite blue mink/silver. And, there are so many decals, incl. the special oversized Reynolds type, where can I restore and/or get the decals??? Thanks. In the process of looking to replace my old Team TI, I ran across an individual advertising a 54cm "Gran Course" 531 (age unknown, silver metallic overall). To my knowledge, Raleigh Nottingham never made a model by this name, but seller swears that is what's present on the top tube decal(Super Course and Gran Sport were mid-range models). I've posted one of the pix from the listing. Could anyone clarify? I cannot seem to dig up anthing further online and am frustrated. Thanks. 80s or so? The model names changed around a good deal then. Those handlebars are something - regular spaghetti bars! I recently purchased a 10-speed Motobecane Nomade from France. I'm not sure how to determine the age of the bike. I was told early 70s, but I'm assuming the late 70s-80s simply based on the font and the "10/20 tubing hi-resilency" sticker on it. Oh and the paint seems to have some slight irredescenence(sp)in it, and is a deep blue color. Sorry no pic, can't find the camera. Please provide a list of original components. By the late 1970s, Motobecane had switched from French to Swiss bottom bracket threading, and by 1980 6-speed freewheels were the industry norm. Cottered cranks lost favor in the mid-1970s. Thank you VVVintage for bringing back this great forum! Now, I'm trying to install a Suntour GT rear derail onto a 70's Schwn Sports Tourer. The ST's DO derail hanger does not have a stop-step and as a consequence the derailleur swings forward and up to the chainstay. Is there an adapter for this or am I missing something? One of the original derail's for this model is the Campy GT. You may have to improvise, but it's not difficult. In one case, I recall having to add washers and to tighten down the pivot bolt to maintain my desired derailleur body orientation. I have also had some success cutting and bending tabs on ordinary metal washers to fashion home-brew derailleur pivot stops. Thanks for the tips John. I think the derail/DO pivot is supposed to swing free so the washer with stop tab or JB-Weld should work. I just checked my 73 Sports Tourer. I was surprised to find that the integral derailer hanger on the dropout had been [fairly crudely] cut off and the Suntour V-GT Luxe der is mounted on a Suntour claw-type adapter. I guess that the Suntour equipment replaced the original "Schwinn-approved" components at some point. Perhaps there was damage from an accident. Thanks for the observation David. Those forged dropouts are pretty stout so I suspect that rather than damage, a previous owner wanted to mount a superior shifting (compared to stock Campy GT or "Schwinn Approved")derail and ran into same problem I did. However, I may be wrong but I don't think its necessary to remove derail tab to mount derail/hanger combo. Good to see the bulletin board is up again!! I have this early 70's Torino 10 speed. Nothing special, just never heard of it. Only thing I can find is a decal saying Made in Portugal. It comes with Simplex derailleurs and DT shifters, Super Olympic 66 centerpull brakes and levers (with the half hoods like the Mafac levers), no-name cottered cranks, Steel textured rims, and wingnuts. Has anyone ever seen or heard of this make of bike before?? The name sounds Italian (it's probably deliberate), and the componentry makes it sound like Portugal's answer to the Peugeot AO-8. Just bought a circa '71(?) 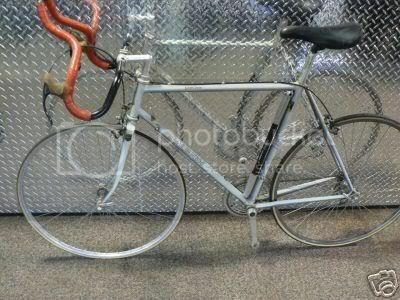 British bike off of Ebay and I'm waiting to take possession of it. A Hugh Porter Team Bantel bike with mostly Campy Nuovo Record components, 531 frame, tubular rims (natch!). However, after "googling" several topics, I haven't been able to come up with any info, history, etc. about this bike. Can anyone supply info on this particular bike, which shop made it, etc? Thanks for posting. I am sure lots of folks here are eagerly awaiting photos. I know nothing about the marque, but can only speculate that you have just bought a high-end machine with a frame made by a small custom shop. Great find! Of course, you will also want to check those Campag. derailleurs and cranks for date codes. Looking for very good/excellent condition Trek 520 from the early 80's (before the integrated seat post), standover height of 34.5 inches (I think that's the 24 inch frame). Will pay top dollar. I have a NOS Campy left crank arm that I would like to know the age. The name (Campagnolo) is in script and size(175) and name (CHORUS) is on front. The back side has a "5/5 1/1" on it. My guess is about 1995. Sounds right because the Chorus group in 1996 was labelled "Chorus 96". It was 8 speed Ergo at that time. I just bought a motobecane at a thrift store. Its my first bike since I was a kid - very excited. Can someone tell me what type of bike and what year it is? It looks like a 1970s bike boom era 10-speed, Ashley -- basic, but quite practical, durable, and fun. Please post a list of components and/or a closeup photo of the drivetrain. I have seen plenty of mixte Motobecanes and Peugeots, but very few step-through frames. Also, please post the serial number and any alphanumeric codes you find on the cranks, derailleurs, brakes, or hubs, as this may help us in our detective work. It looks VERY clean -- nice find! Again I didn't see a place to post this. Crossway 850 Hybred.The natural finish aluminum frame has some pretty serious surface corrosion around the water bottle area and a number other spots.It appears it never had any sealer on it.Probably permanently scarred but I would like to clean it up some if possible.I was thinking starting with fairly course sand paper ending with something like 400 grit.It appears to have a very fine polished brushed finish now. I picked this up mostly for speculation figured I can clean and tune and turn it over so I can put the money toward more toys for my collection.